The Impactor Targeting Sensor (ITS) is the primary targeting camera. 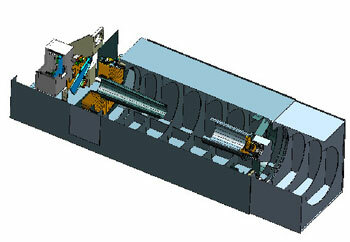 A duplicate of the MRI but without the filter wheel, the ITS will be used to navigate the impactor to the comet. In addition the images taken by the ITS before its optics are destroyed by dust as it flies towards the comet will hopefully provide the highest resolution images of a cometary nucleus before the Rosetta mission lands on a comet. Provided that the ITS optics survive to within moments of impact, the scale of the last image will be about 0.5 m/pixel or better, which will be a major scientific achievement. The ITS is mounted inside the impactor with its boresight parallel to the impactor's x-axis. During the approach to the comet nucleus, the ITS boresight is aligned with the impactor's velocity vector to allow proper targeting on the nucleus. One star tracker is mounted to the sensor optical bench with its boresight oriented normal to the ITS boresight for maximum accuracy.